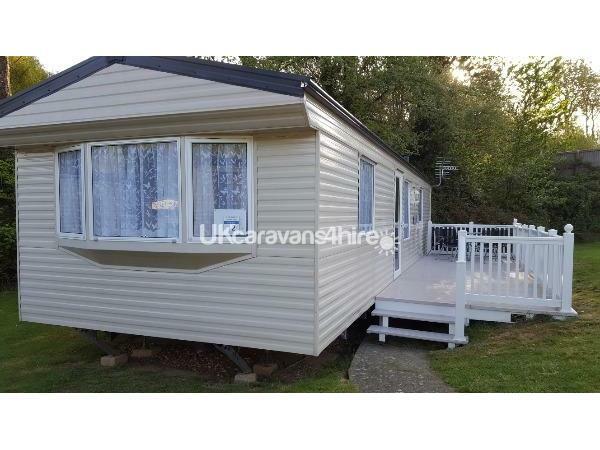 Caravan to let on the Isle of Wight at Lower Hyde Holiday Park. This is a modern caravan, which can sleep up to 6 people, it comes with heaters in each of the rooms and a gas fire in the central living room. I have installed a side decking area with seating for 4 people. The main bedroom is situated at the front of the caravan and is en-suite with its own toilet and shower. This van is strictly no smoking. The location of the caravan is in a good position for the clubhouse, restaurant, children's play area and swimming pools. It is a five minutes’ walk from the shop and launderette, whilst still being secluded even at peak times. Lower Hyde Holiday Park is situated within a 5 minute walk or drive from Shanklin town centre and approximately 10 minutes drive from Shanklin beach. Internally the caravan is in really good condition. There are 2 bedrooms (1 double and 1 twin) plus there is a pull out double sofa bed in the living area of the van. 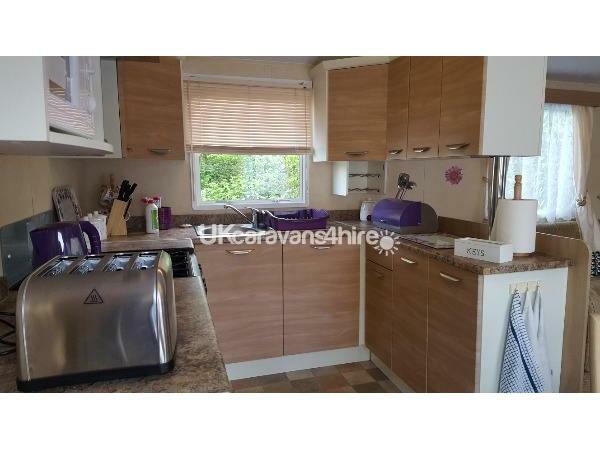 The caravan is fully equipped with toaster, kettle, microwave and fridge freezer. In the lounge area there is a flat screen smart TV with an internal DVD Player. All bed linen is provided within the price. 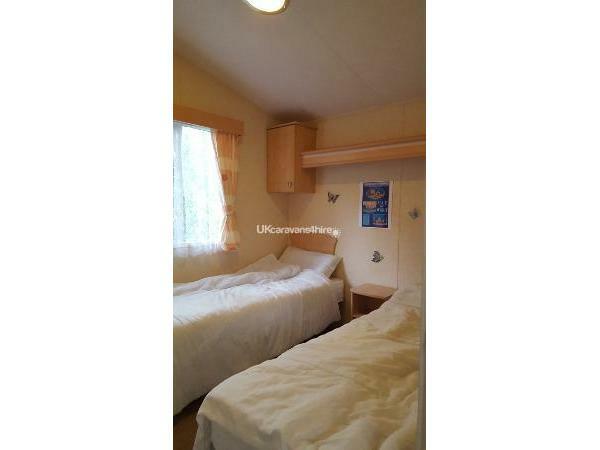 Prices are per unit not per person and are dependent on times of year and school holidays. Additional Info: Lower Hyde situated very close to Shanklin town centre and local bus and train stations. 3 supermarkets and Shanklin beach within 10 minutes drive. Lower Hyde has an outdoor and indoor pool, launderette, bike hire, childrens' playground and childcare facilities. There is a large restaurant, amusement arcade in addition to daytime and evening entertainment to suite all ages. Perfect holiday. Loved the caravan and the layout. really works having the bedrooms opposite ends both with ensuites Ideal when you have older children. The caravan is far enough away without being too far from amenities and ideal for walking into the town and supermarkets. The week we were there the site put on an open air movie night showing the greatest showman, brilliant! The Caravan is clean, well equiped and very easy to move straight into so you can make the most of your holiday. And the biscuits and squash was such a lovely welcoming touch. We would definitely stay here again. Thank you Stella. Stella's caravan was very homely, some lovely touches, and so spacious! We were impressed by the cleanliness, the storage space and how well it was equipped. We particularly liked the layout with one bedroom at each end, which was ideal when the children went to bed early. The ensuites were very welcome too. As a grandparent with young grandchildren staying it was nice to have such a spacious living area, and dining table, and the decking was perfect for the family to sit outside. In fact the position of the caravan made it a safe area for the children to play, away from the cars. It also meant that it was very quiet, away from the main entertainment area, but not too far to stroll to the facilities on offer. A short walk also took you to the local supermarket which, with young children, was very welcome The owner was extremely friendly and obliging, answering all our questions promptly before the holiday, and offering useful suggestions for our stay. We would highly recommend Stella's caravan and Lower Hyde Caravan Park and would happily stay here again. 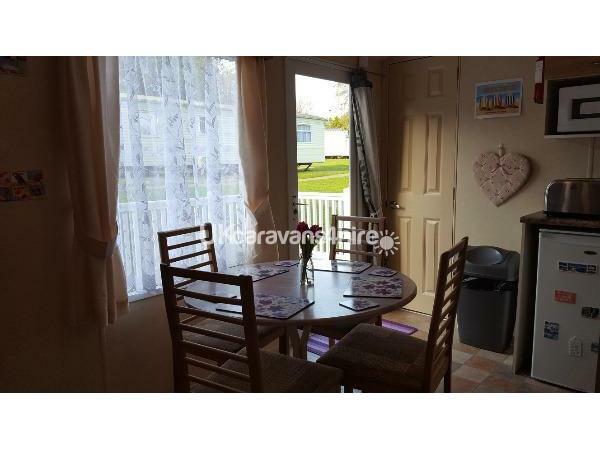 A fantastic holiday home which really is home from home being very clean ,spacious and well equipped there are lots of storage cupboards and the caravan is in a great location !thankyou Stella we had a fantastic holiday and can’t wait to book again. Such a lovely caravan with a homely touch. Everything we could have asked for was there. Lovely quiet location and parking nearby. Extra heating supplied as we were there when it snowed. Will hopefully be booking again. A wonderful caravan with lots of extra touches which made it feel like home. 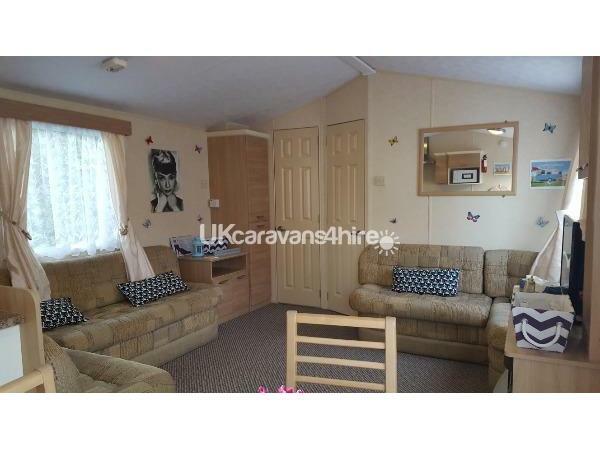 Very clean and tidy and plenty of space for 2 adults with 2 children. The welcome pack of tea, coffee, squash and biscuits was much appreciated after the journey down. Nice quiet location off the road and large decking to sit out on and enjoy the sun. 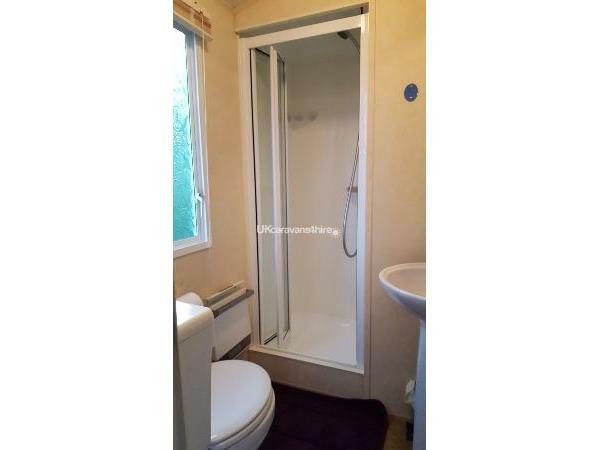 We loved each having an ensuite bathroom, made getting ready so much easier in the mornings! Beds were already made too which was very nice as that is one of the dreaded things that we normally have to do on arrival! We had a wonderful holiday and were very sad to leave this beautiful caravan-will definitely be coming back and highly recommend it to everyone. Stella is a lovely lady and very helpful, always ready to answer any questions you may have. This caravan was absolutely lovely. So nice for my mother in law and me to have our own toilet and shower. The beds were already made up which was a blessing. There was a welcome pack when we arrived consisting of tea, coffee, biscuits, and cordial. We particularly liked the butterflies on the walls and the rest of the decor was just as nice. Plenty of storage space in the cupboards. Can't wait to hire this caravan again. 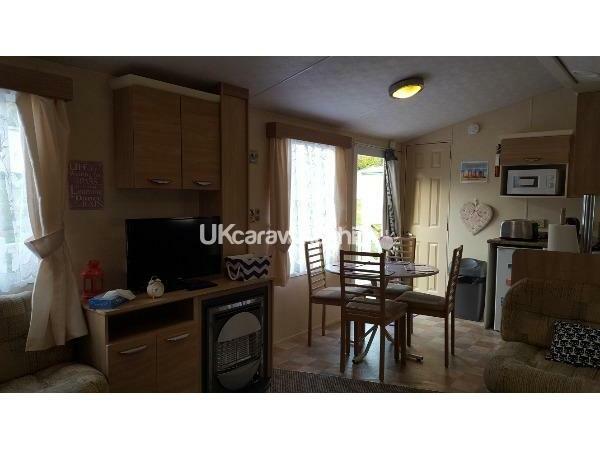 This is a beautiful 2 bedroom 2 bathroom caravan. My daughter loved that she had a bathroom to herself. There's plenty of space for everyone and the decking area is a lovely touch. The location is great as it's in a quiet spot but not to the swimming pools and entertainment. The caravan was spotless on arrival and communication and directions with Stella was great. I would highly recommend staying here. This caravan is absolutely beautiful. 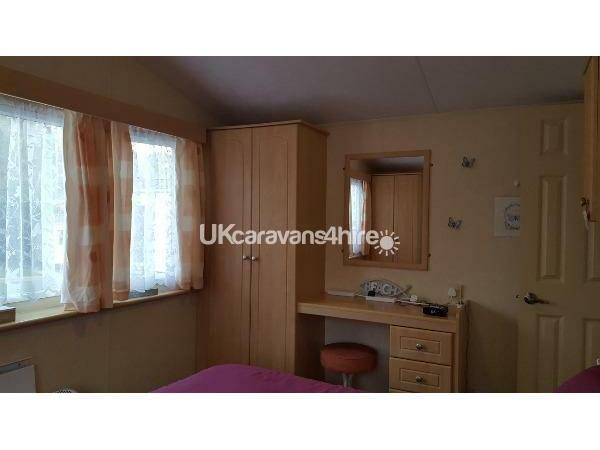 The decor is so homely and the caravan itself is very spacious. We had 3 younger children with us and all fitted easily into the 2 bedrooms. The kitchen is equipped with everything we needed and the decking was a lovely addition for dining outside. The caravan is located in a perfect spot, quiet and with sun shining on the deck area all day, perfect for an evening drink watching the kids play. 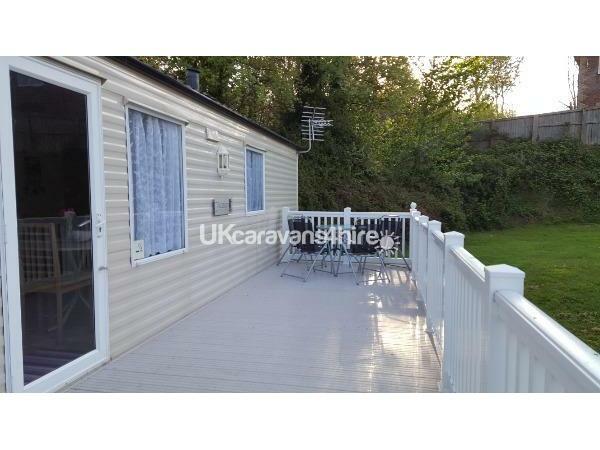 I would thoroughly recommend this caravan & Stella was great at confirming the booking and checking all ok on arrival to make us feel relaxed and enjoy our holiday. Thankyou! Thank you for the fab review, it was lovely to have you staying in the caravan and you are welcome back anytime. 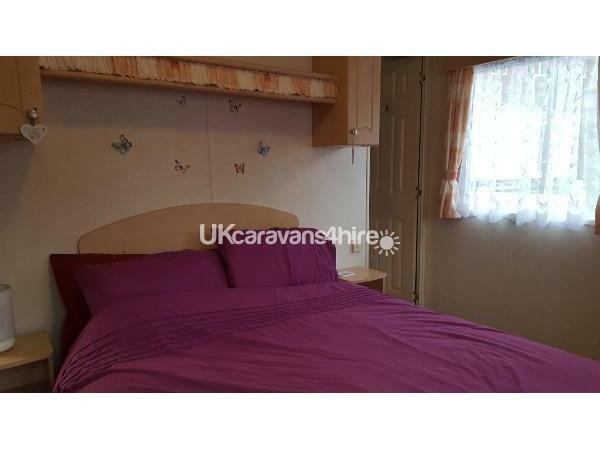 Lovely caravan with loads of room and an excellent layout with 2 washrooms. We stayed for 2 weeks and loved it. Spotlessly clean with everything you could need. Would definitely stay here again if visiting the Isle of Wight. The walk into Shanklin is about 10 minutes and Lidl is about 5 minutes. 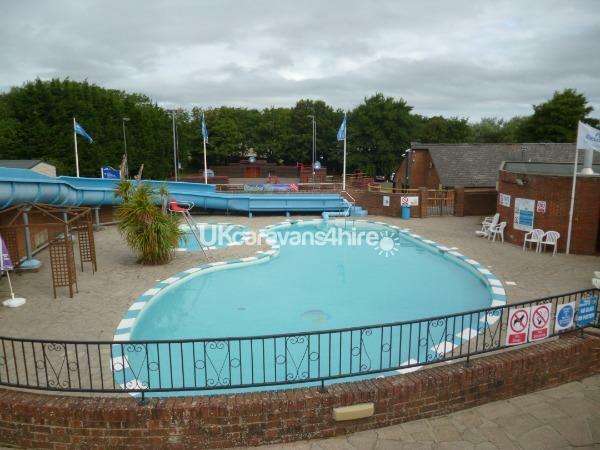 The caravan is well sited with a short walk to the clubhouse and swimming pool but in a nice quiet location. Stella was very helpful and organised everything perfectly. I would recommend this to anyone visiting the Isle of Wight. My husband, myself and 2 young children stayed here for 3 nights recently. We didn't want to leave! The caravan is spotlessly clean, comfortable and surprisingly spacious - my husband is 6ft 4in and didn't bang his head once :) We particularly liked the little extras that come with this caravan - toilet rolls, tea bags, coffee, sugar, squash and biscuits - very welcome after a long journey! The caravan is nicely situated on the holiday park, nearby is a childrens play park, swimming pool, bar, restaurant, launderette, main reception and a well stocked shop plus there is a co op and a lidl just outside of the holiday park. All you need for a lovely family break! We have stayed in a few caravan parks around the uk - I would say this is one of the nicest caravans we've stayed in! Thank you for letting us stay here! Thank you for the lovely review and looking after my caravan as though it was yours. It was a pleasure to have you stay there and you are welcome back anytime. Wow! Although this is not a brand new caravan it is spotless, couldn't fault a thing. What we saw and used of the site is lovely (including the food/bar). The caravan is in a lovely quiet spot with no-one walking past you, even though there is a little cut through behind you leading to Lidl. Although we didn't get to meet Stella as there is now a key safe, she couldn't of been more helpful.There is everything and more that you need for your stay, would definitely say this was more than a 'caravan'. Definitely recommend to anyone wanting to stay on the I.o.W. Thank you for allowing us to use your holiday home. This holiday home far exceeded our expectations both on cleanliness and how well it was equipped. We were surprised how spacious the bedrooms, ensuites and the living area were. As a family of 5, this is very important to us. 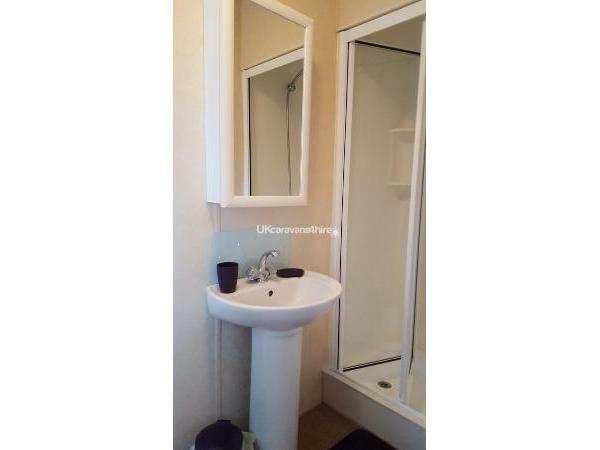 There is also ample storage, cupboards, wardrobes, drawers etc in all rooms. The owner was extremely friendly and obliging. Stella met us at the caravan on our arrival and made us feel really welcome. We're already looking forward to booking this holiday home from home again.